Many iPad users who install Chrome or IE on their iPad devices may have encountered such kind of problems. It’s quite common as Apple itself doesn’t support Web. People who want to watch WebM on iPad in Safari always meet WebM iPad playback problems. In this guide, you will get multiple effective solutions on WebM iPad playback issues. You will easily learn how to play WebM files on iPad and other iOS devices in different ways. 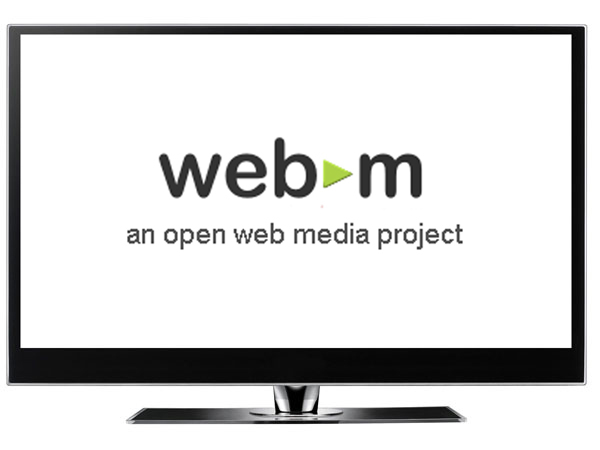 WebM is an open media file format designed for the web. WebM files consist of video streams compressed with the VP8 or VP9 video codec, audio streams compressed with the Vorbis or Opus audio codecs, and WebVTT text tracks. The WebM file structure is based on the Matroska media container. As a royalty-free alternative to H.264 standard, it’s used for high-quality-but-low-bandwidth videos on sites like YouTube, Reddit, 4chan, and the like. Those are the reasons why people might prefer WebMs to gifs, MP4s, MKVs, or FLVs. However, this has resulted in a bad snag for those people who want to play WebM files on iPad or iPhone, since Apple’s QuickTime player codec doesn’t support WebM. That means the original iOS devices have no support for WebM file playback in Safari, Chrome (which uses the same WebKit-based rendering engine on iOS), any third-party browser or any app integrating a web view. So, does that mean we can’t play WebM file on iPad or other iOS devices? Of course not. We’ve got multiple effective solutions on how to watch WebM on iPad for you. As long as you know the URL of your WebM video, you could watch WebM files with 3rd-party iPad WebM player app on your iPad. There are various kinds of WebM player iPad accepting for fixing WebM iPad playback issue. PlayerXtreme HD is one of the top-notch choices. 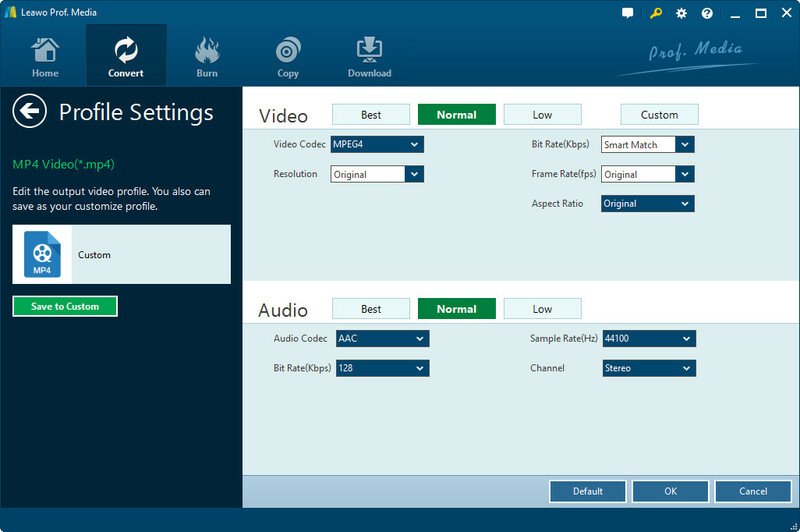 It’s a video player that could run on various devices like iPhone, iPad, PC, Mac, TV, etc. 1. Find the WebM video you want to watch on your iPad and open its URL in a new tab. 2. 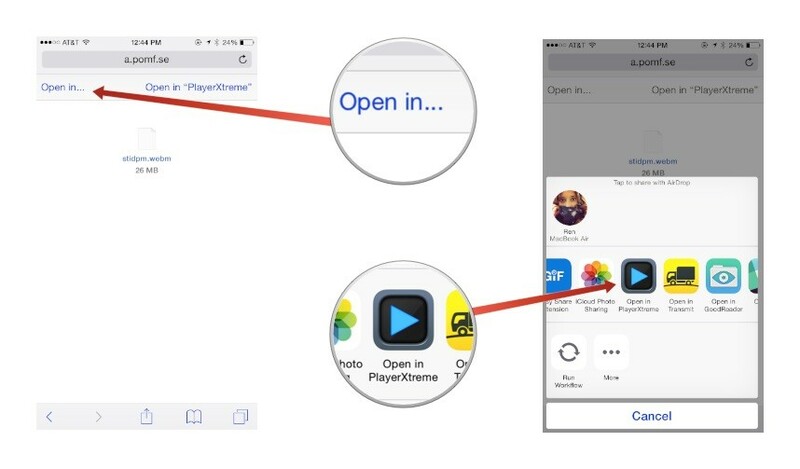 Tap the “Open In” link in the Safari window. 3. Select “Open in PlayerXtreme”. 4. The PlayerXtreme HD would then automatically pop up and play the WebM file on iPad. You could also alternatively copy and paste the URL of WebM video into PlayerXtreme HD app for playback, but that requires you to unlock its pro features, which costs $3 as in-app purchase. If you have WebM files on your computer and want to play these WebM files on iPad, all you you need is a WebM iPad video converter. A WebM iPad video converter could help you convert WebM files to iPad compatible formats like MP4 or MOV and then let you freely play WebM files on iPad. Leawo Video Converter is one of the best WebM to iPad converter tools that could realize this for you easily. 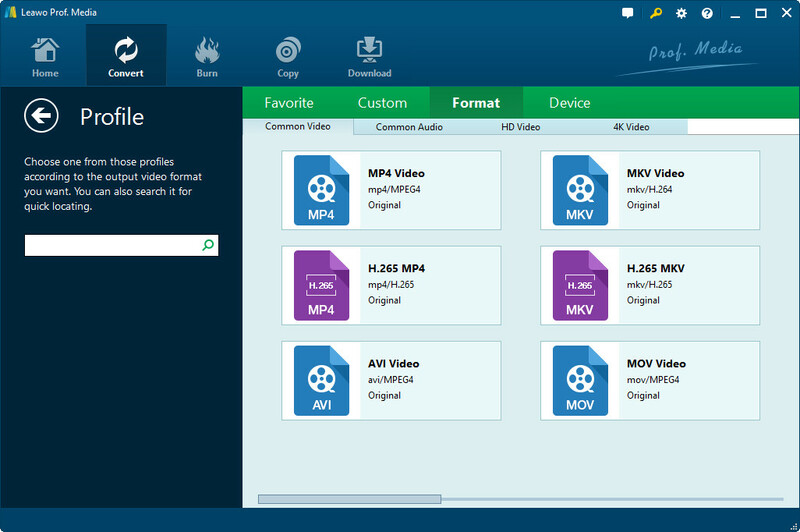 You could use this video converter to convert WAV to MP3 , MP4 to MOV, FLV to AVI, etc., but also convert videos to WebM format as well like AVI to WebM. 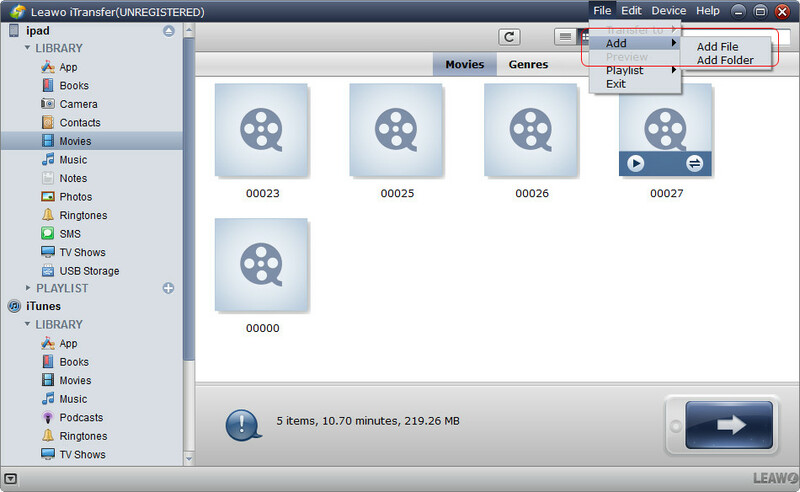 After installation, launch it and then click the “Video Converter” option. Then, directly drag and drop source WebM file(s) to this program. Or, you could click the “Add Video” button to browse and load source WebM files. Then you need to set iPad friendly format as output format by clicking the drop-down box right before the big green “Convert” button and then hitting “Change” button on the drop-down menu. Choose either MP4 Video/MOV Video from “Format > Common Video” group or any iPad profile from “Device > Apple” group. The later one is recommended. Re-open the drop-down menu above mentioned and then click “Edit” option to enter the “Profile Settings” panel, where you could adjust video codec, video quality, bit rate, aspect ratio, frame rate, audio codec, audio quality, sample rate, channel, etc. This is optional. Then you need to set an output directory as a path to save converted WebM files. Click the big green “Convert” button and then on the popup sidebar set a folder as output directory in the “Save to” box. After setting output directory, hit the bottom “Convert” button to start converting WebM files to iPad friendly formats. The conversion would start instantly. You could view the converting progress. When the conversion finishes, the task of playing WebM files on iPad is still not finished yet. You still need to transfer converted WebM files to iPad before you could play WebM files on iPad. Now, you need the help of iPad transfer app, like Leawo iTransfer, a professional data transfer program that could transfer data and files between iOS devices, iTunes and computer in simple clicks. Compared to iTunes in data transferring between iOS devices and computer, Leawo iTransfer allows you to transfer desired content and has no influence on existing data and files. Follow the below content to learn how to transfer converted WebM files to iPad tablet. Connect iPad to computer via the USB cable Apple has provided for you. And then launch Leawo iTransfer. This iPad data transfer would detect your iPad immediately. You could see all categories of your iPad library on the left sidebar. Navigate to “iPad > LIBRARY > Movies” tab on the sidebar. Then click the “File” menu and choose “Add > Add File/Add File Folder” option. This iPad data transfer would guide you to browse and load WebM files from your computer. When you’ve chosen the right WebM files for adding, click the “OK” button. This iPad data transfer software would immediately start to transfer converted WebM files to iPad. When the transfer is finished, disconnect iPad with computer and then open the “Video” app on your iPad to find out the transferred WebM files. Through a simple click, you can easily play WebM files on iPad now. Leawo iTransfer not only allows you to transfer videos from computer to iOS, but also enables you to transfer data like photos from iOS to computer and transfer data between iOS devices. Now, you must know how easy it is to watch WebM on iPad. Hope these solutions would be helpful to you on how to play WebM files on iPad and other iOS devices.